Most of the people ask us whether they have to do court marriage or nikah? For all those people who are confused to take decision and don’t know the difference between court marriage and nikah through this blog we are going to finish this confusion. Let us guide you that the nikah in Pakistan is a part of court marriage in Pakistan which means that if you are doing a court marriage in Pakistan through a court marriage lawyer in Pakistan you will first have to perform nikah through a nikah khawan. Whenever you visit a court marriage lawyer in Pakistan for the court marriage services such lawyer before proceeding further will get your nikah done. This nikah is done by the nikah khawan who is on the panel of such law firm. This nikah khawan provides his services in courts of Pakistan and on the instructions of lawyer who have hired him or will pay him to visit his office for the nikah services in Pakistan. These nikah khawans are professionals and licensed by government to perform their duties so nikah is one of the part of court marriage services in Pakistan. Once the nikah is conducted in the office of lawyer the lawyer will take you to the court for further proceedings. The lawyers normally don’t take the clients directly in courts of Pakistan because doing a nikah there is a worst nightmare for the reason that the courts are fully crowded and the privacy of the clients is on stake moreover hooting and staring by criminal and others are casual there so better find a decent lawyer and prefer a decent place for court marriage and nikah services just like Nazia Law Associates in Lahore Pakistan. 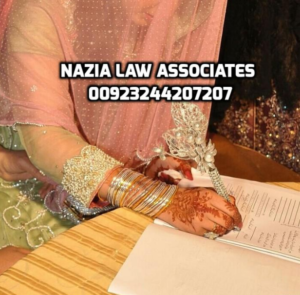 Even if you wish to get nikah only you can contact our law firm and we will conduct your nikah service in Lahore. The main difference between court marriage and nikah is that even in court marriage the nikah is solemnized as per Islam and sharia. For court marriage after the nikah when your nikah is done a complete file is prepared by our law firm as per the situation of your client and nikahnama is attached with this file and submitted in the court where the bride before a judge admits that she has solemnized this marriage with her free will , without any coercion or threat and during the court marriage procedure in Pakistan she also states before the judge that no one has kidnapped her etc etc and this statement after coming on record the court passes a protection order which saves the couple against vexatious case. Nikah has less legal protection whereas court marriage gives more legal protection. In Nikah you don’t need to go to court whereas in court marriage you have to go to court also. For both court marriage and nikah in Lahore feel free to contact us as we arrange your nikah and court marriage. You have any question about difference between court marriage and nikah you can contact our law firm and ask for Advocate Nazia.